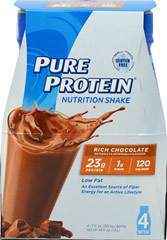 Pure Protein® Shakes are delicious and convenient-perfect for before or after a workout, or any time of the day! Our shakes are low fat and packed with 23 grams of protein to help support lean muscle and strength, plus an excellent source of calcium to help build strong bones. Milk Thistle, derived from a purple flower, has been used in Greek practices for thousands of years. Adults can take one softgel once or twice daily.